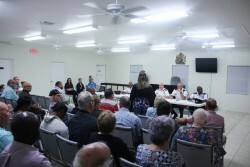 On Thursday, 4 April, members of the RCIPS Senior Command Team, including the Commissioner of Police, hosted a Community Meeting in Cayman Brac. The meeting was held at the Aston Rutty Civic Centre, and was well-attended by members of the community, ministers, government staff, teachers, and others. Representing the RCIPS were Senior Command Team members Commissioner of Police Derek Byrne, Superintendent Robert Graham and Police Spokesperson Jacqueline Carpenter, together with Inspector Kevin Bogle, the new Area Commander for the Sister Islands, and Police Sergeant Ashton Ferguson. During the meeting the Commissioner welcomed the community’s feedback on the level of police service being provided in Cayman Brac, specific areas of concern, and suggestions for improvement. General road safety was raised as a top concern by most participants, including drunk driving, speeding, unlicensed and uninsured driving, and cyclists riding with improper lighting at night and riding against the flow of traffic. Attendees at the meeting also expressed the desire for police officers to be more visible in their communities, and be more consistent about proactively checking in with businesses and interacting with the public. Some stated that they were unaware of who their police officers are. Another issue raised was the level of communication by officers in issuing updates on investigations. However, it was noted that people were almost always able to receive a response when calling or contacting the station. Overall those in attendance expressed an enthusiasm and willingness to work with the police to build a stronger relationship, a sentiment which the RCIPS staff echoed. In addition to using the community’s feedback to help inform strategic changes in how the police service operates in Cayman Brac, the RCIPS will be launching a new Facebook page specifically for the Sister Islands, as well as a section of the website dedicated to covering issues relevant to Cayman Brac and Little Cayman. These new targeted information portals will be used to highlight the activities of officers on Cayman Brac, and to strengthen the level of community engagement.